it’s been a while since we’ve looked at images of pretty clothes. Here are some that were fashionable in Regency England.I don’t really like much the fashion styles of this period cos I don’t think they are very flattering, but I still love looking at these images. Aren’t they delightful? 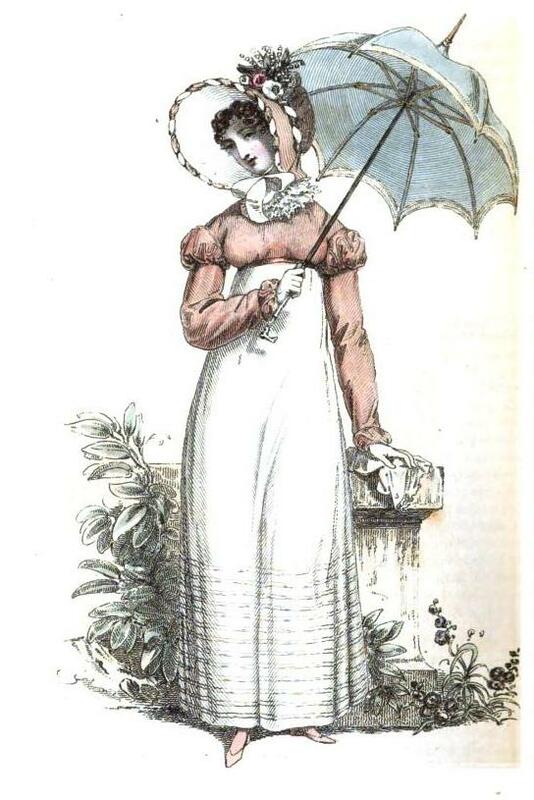 A Morning dress, composed of cambric muslin: the body is made high, and is richly trimmed with work both at the neck and the bottoms of the sleeves; it fastens behind; the back is full, but the front is tight to the bust. The bottom of the skirt is finished, in the French style, with a number of small tucks. The spencer worn with this dress is composed of pale fawn-coroured gros de Naples: the back is plain; the front is cut bias, and in such a manner as to display the form of the bust very advantageously. The sleeve falls low over the hand, and is wider than they have lately been worn; it is finished at the bottom by a trimming of the same material, laid on in full scollops: halfsleeve to correspond, the fulness of which is confined by straps. There is no collar, but a rich lace ruff supplies the want of it. 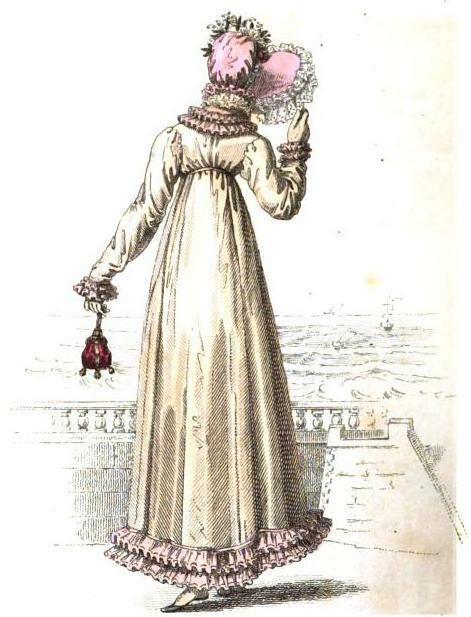 Headdress, a bonnet composed of pale rose-coloured gros de Naples, and lined with white satin: the crown, which is very low, is set in in the same manner as the caul of a cap: the brim is of a round shape, and very deep; it is ornamented at the edge with a twisted rouleau of white and pink satin, and a similar one encircles the bottom of the crown. A bouquet of roses and lilies of the valley is placed in front, and it ties with white ribbon under the chin. White kid gloves, and pale rose-coloured kid slippers. 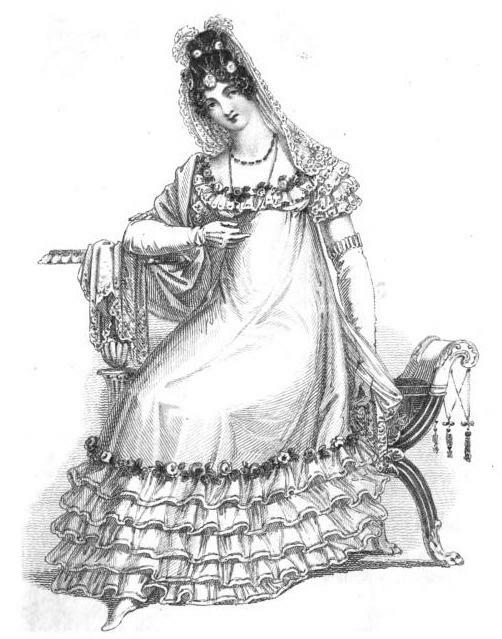 A white gauze dress over a very pale rose-coloured satin slip: the body is composed of satin; it is tight to the shape, but there is very little of it seen, because the bust is trimmed all round with a broad blond lace, which is set on very full; this trimming is headed by a wreath of intermingled white and red roses, surrounded with leaves. The sleeve is short; it consists of three falls of blond lace over a tight under-sleeve of satin; the lace is very full, and is not confined at all to the arm: this neglige style of corsage has a new and very striking effect. The skirt is trimmed with five flounces of the same material, placed one immediately above the other, and headed by a wreath of flowers to correspond with the bust. The front hair is disposed in curls on each side of the face; the hind hair is dressed extremely high, and brought very forward. The head-dress consists of a double wreath, composed of mingled white and red roses and golden wheat-ears: one part of this wreath is put low on the forehead, the other encircles the full tuft of hair on the crown of the head: a white lace veil is attached to the back of the head, in such a manner as to form a tasteful drapery. Necklace and ear-rings, rubies mixed with pearl. White kid gloves, and white satin shoes. We are indebted for both our dresses to Miss Pierpoint, maker’ of the corset a (a Grecque, of No. 9, Henrietta-street, Covent-Garden. A Lemon-coloured pelisse of shagreen gros de Naples, or double twilled sarsnet. This pelisse is of a peculiarly novel and elegant fashion, being trimmed round the border with two narrow fluted full flounces, headed by a layer of white satin, which gives a splendid finish to the dress, and renders it more adapted to the carriage or public promenade: the collar and wrists of the sleeves are trimmed to correspond with the border. Large bonnet of pale pink gossamer satin, edged with two rows of blond,of a rich pattern, and crowned with a half-wreath of flowers. Double morning ruff of fine Mechlin lace. Marine boots, Parisian ridicule, and Limerick gloves. A Pelisse composed of kerseymere: the colour is a peculiar shade of grey; it is lined with white sarsnet. The body is tight to the shape, the waist is rather long, and the sleeve is set in so as to just touch the point of the shoulder: the sleeve is wide, and falls very much over the hand. The skirt is moderately full, meets before, and fastens down on the inside. 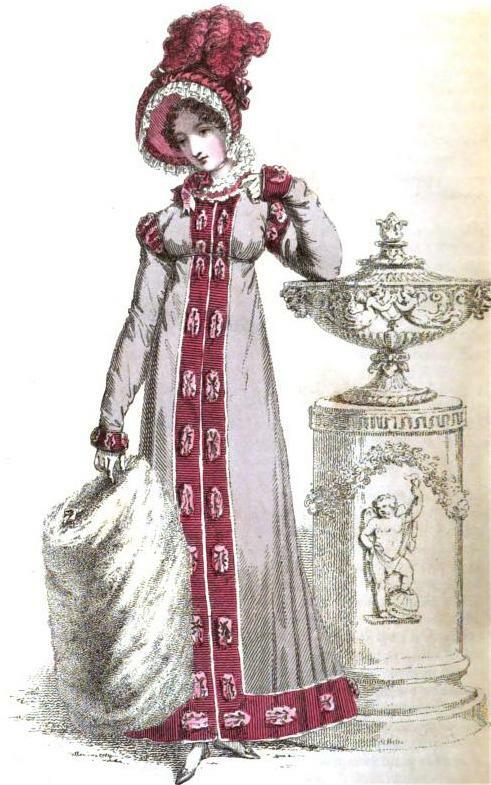 The trimming is composed of ruby-coloured velvet; it is of a new pattern, and exceedingly rich and elegant; it goes round the bottom, and up each of the fronts. The epaulettes and cuffs correspond with the trimming. High standing collar, trimmed in a similar manner. Head-dress, a bonnet composed of ruby velvet, intermixed with levantine: the crown is made of folds of these two materials, so disposed as to form a point in the centre, which has a light and novel effect: the brim is large, and of a singular but becoming shape; it is finished at the edge by a rich roll of ruby levantine, to which is attached a full fall of blond lace, set on narrow towards the ears, and broad in the middle of the brim: this style of trimming adds much softness to the countenance. A high plume of ostrich feathers, to correspond, is placed upright in front, and a rich ribbon ties it under the chin. Gloves to correspond with the pelisse. Halfboots, the lower part of black leather, the upper part grey levantine.